Why do you do this to us, Apple? The new iPhone 8 and iPhone X support “wireless” charging. That is, you can toss them onto a charging mat instead of plugging in a Lightning cable. Obviously this is more convenient when you’re at home — you can put a pad on your nightstand, desk or hallway table. But there are other advantages to iPhone wireless charging that aren’t so obvious. And there is also one big disadvantage — one that has the potential to cause major damage to the Earth. Let’s get to that disadvantage first, because it’s important. Wireless charging pads are inefficient. Depending on their design, and on how accurately you place your device onto the charging mat, efficiency runs from as little as 30 percent to 80 percent. That is, even in an ideal setup, 20 percent of the power used to charge your device can be wasted. Efficiency is improving all the time, but is still worse for low-power charging (like phones) than it is for high-power charging (electric cars), where efficiency is nearing that of a wired connection. For each individual device, that’s not really a big deal. But Apple sells 10 iPhones per second. That means wireless charging pads soon will become ubiquitous, and that power wastage will be multiplied by tens of millions of users in a few years. And that’s bad news for the climate. Apple’s Phil Schiller announced in the 2017 iPhone keynote that Apple is working to “Make the wireless charging experience even better,” but did not mention efficiency. 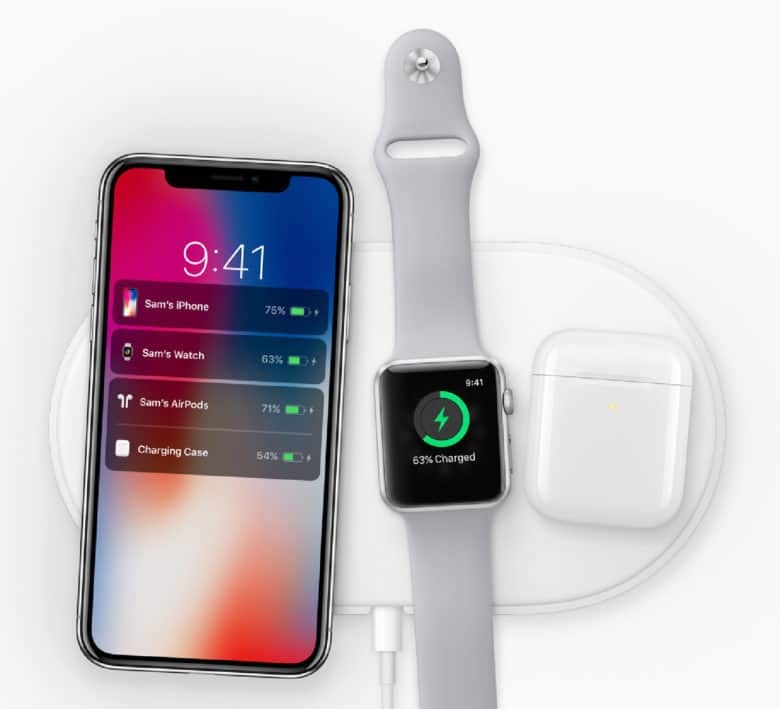 Instead he focused on the ability to charge several devices optimally on the same mat, and have them talk to your iPhone to display their charge levels on its lock screen. Charging efficiency will surely be a priority, though, so perhaps Apple will improve things for the entire industry. The other big con of wireless charging is that it’s a lot harder to use your Phone while it’s charging. With a wire, you can move as far as the wire will let you. With wireless charging, the iPhone has to stay on the mat. That’s fine if you’re just playing music, but a pain for anything else. Even sending an SMS is harder if you can’t pick the phone up to type. On the other hand, people will go through fewer cables when wireless iPhone charging becomes the norm. Wear and tear on cables will be reduced to almost nothing. Once you have plugged in your “wireless” AirPower charger with its wire, you’re done. There’s no constant plugging and unplugging to fray the connection between your Lightning cable and plug. That’s got to count for something, sustainability-wise. The biggest advantage to wireless charging is convenience. It may not make too much difference for a phone, but when all your accessories are charge-pad-enabled, things get a lot more interesting. Apple says future AirPods will have AirPower-enabled case, so you can just drop them onto your pad. The Apple Pencil is in desperate need of wireless charging. The current (pun intended) method is just a joke. Wireless charging is perfect for tiny accessories like those. And imagine having a charging pad inside a desk drawer. You could just toss your iPhone backup batteries in there for storage, and they’d always be full when you needed them. You also only need one wireless charger for multiple devices. There’s no need to unplug your iPhone to charge your partner’s iPhone, for example. You should never plug your iPhone into an unknown cable. All kinds of malware could be hiding in there. But dropping it onto a charging mat should be safe (until somebody works out an exploit, at least). And now that the iPhone supports charging mats, you should expect to see them appear in hotels, restaurants and other public spaces. The ubiquity of charging stations might change the way we work. Instead of taking a big backup battery out with you, you could just drop your iPhone onto a convenient public charging mat whenever you see one, trickling power into your battery throughout the day. Charging mats may become as common as free Wi-Fi in coffee shops. Many of us will be happy with cables, but as more and more wireless charging pads appear, they’ll begin to take over. Especially as your new iPhone X or iPhone 8 will already support wireless charging out of the box. Here’s a scenario to consider. You’re at a friend’s home, and your battery is running low. Would you ask them if you can charge your phone? Sure. But if there’s a charging mat on the coffee table, most of us wouldn’t even bother to ask. We’d just drop the phone on there. That’s convenience.